Everyone is aware about the diligence, forward looking and sincerity of rulers of UAE for prosperity of their citizens and foreign workers and growth of economic activities in the country. For this purpose, the government of Dubai and its various departments measure the performance of various sectors and make changes according to situation. We have seen several such measures taken in recent past including exemption of VAT on few sectors, reducing fees for few services etc. Continuous evaluation of performance and taking necessary steps accordingly are few steps that make UAE unique among most of the other regimes in the world. 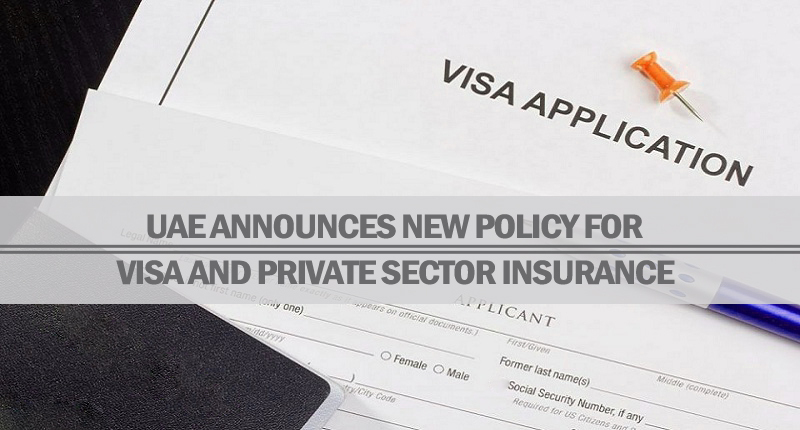 In a latest such measure, UAE has approved new decisions regarding insurance policy for private sectors’ employees and providing relief to masses about visa services. According to details, these decisions were taken by the UAE cabinet that was chaired by Dubai’s ruler and UAE’s PM and vice President Sheikh Mohammed bin Rashid Al Maktoum. The cabinet introduced new policy for insurance of private organizations. Previously, it was mandatory for employers to deposit AED 3,000 per worker for their insurance. Now it is replaced with AED 60 per year per worker. This new step will continuously support workers’ rights in private sector but it will also reduce burden on employers. Through this major step, private companies are allowed to recover around AED 14 billion that they can utilize for growth of their businesses. This is also an important step for enhancement of ease of doing business in UAE that will ultimately result in growth of market. This new system will also provide more benefits to workers as it will cover wide range of facilities including vacation allowance, service benefits, overtime allowance, work injury, worker’s return ticket etc. The cabinet also approved new measures to facilitate visa services for residents, families, visitors and people overstaying in the country. Now, the residency period for university students, dependents on their parents, has been increased to 2 years. Apart from that, transit passengers have also been exempted from all entry fees for the initial 48 hours. These passengers can also extend their transit visa up to 96 hours for fee of only AED 50. A special visa is also approved for those job seekers who overstayed their visa but want to work in the country. They can get benefit with a temporary new 6 month visa that will allow them to find few opportunities in UAE. Leniency is also showed in new visa rules towards those who enter UAE illegally. Now, they can leave voluntarily without any punishment except “no entry” stamp for two years if they could provide valid return ticket. Physical and financial facility is also provided to those who want to renew or adjust their visa. Now, they don’t need to leave and re-enter the country for this purpose after paying fee for staying in UAE during the process. All these latest steps prove that the government is trying to provide maximum benefits to foreign workers, private employers, students and jobseekers. If you want to take full advantage of latest policy regarding visa services in Dubai and other emirates of UAE, then you can contact Riz & Mona Consultancy for detailed information and assistance.